This was taken at the Oregon Coast Aquarium during a random trip to the coast at the beginning of the year. We ended up getting there late in the day and pretty much had the run of the place. Apparently the aquarium doesn't get many visitors on New Year's day. Anyway, I should have brought a tripod if I knew it was going to be this devoid of people. Instead I had to rely on a steady hand and a convenient wall (such as the case in this shot) to get sharp photos without resorting to ugly flash. This is a fairly new exhibit at the aquarium. It is called Passages of the Deep and there are a series of three tunnels like this. 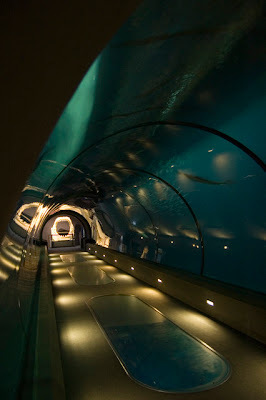 And yes, those are some shark jaws at the end of the tunnel. This whole exhibit was created out of the old Keiko orca tank ("Free Willy" killer whale) after they shipped him back to Scandinavia.